It’s time to glitter bomb the NRA. Who’s in? I join my voice with many other LGBTQ voices to say the time has arrived to once and for all declare that gun control is a gay issue. Of course, all issues are gay issues, but this issue is perfectly positioned to be transformed by the set of skills and the history that the queer world embodies. It’s tragic that it has taken the massacre at the Pulse nightclub to poke the sleeping bear of the LGBT community. But now we are awake. This is the moment; this is the time. Let’s wrap the NRA headquarters in a huge rainbow flag. Let’s get 1,000 LGBTQ folks to the NRA headquarters in Fairfax, Virginia, and wrap it in a huge Gilbert Baker rainbow flag and with glitter and feathers shut that building down. And do it again and again. 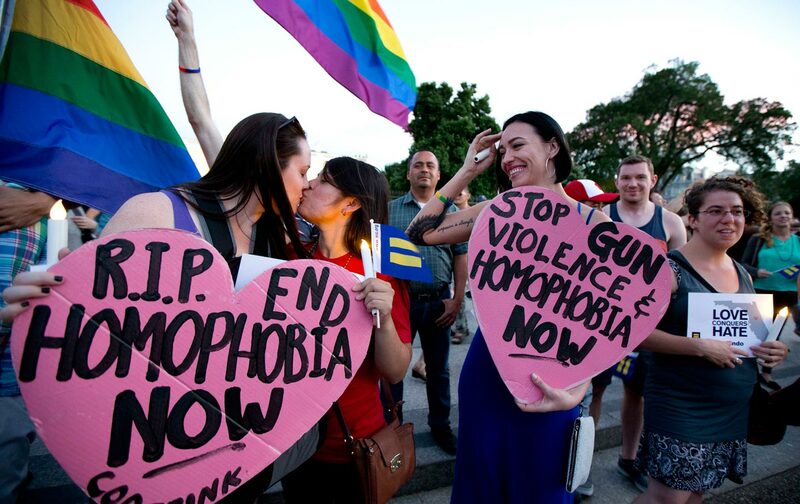 Let’s get waves of LGBTQ folks to take rainbow flags and sew shut the doors of offices of senators and congresspeople who have voted over and over against sane limits on weapons of destruction in the hands of everyday Americans. Given the events of the last week—the slaughter of mostly young, mostly Latino LGBTQ people—let us take the organizing skill, the fearlessness, the willingness to confront bullies and dramatically kickstart the stalled movement for meaningful gun control in this country. The gun-control movement needs a left flank that can take to the streets, resists calls for polite dialogue and demands real change. We are not afraid. Historically, we have been called criminals by the legal system, sick by the psychiatric profession, and sinners by religion. Only because we marched in the street, got arrested, devised legal strategies, wrote books, made movies and plays and music, did any of that change. We did it with the HIV/AIDS movement. We did it with the movement for marriage equality. We believe in impossible political change, in the long odds, in the unpopular movement. Let’s do it again and get these guns off the street. We may have different views on the Second Amendment. But all of us want to take the country back from the NRA. When around 90 Americans are killed with guns every day, all Americans are at risk. But there is a common thread among so many shootings: They are aimed at American communities that face discrimination. From Charleston (African-American churchgoers) to San Bernardino (government employees) to Orlando (LGBT people, most Latino) to young black men on our streets to the daily toll on women through domestic violence. The thread is this: Guns turn hatred deadly. All with the same weapon. We as a community are comfortable in the fringes and know that there is tremendous power there waiting to be tapped. I’m ready to go to the NRA headquarters and wrap it in a rainbow flag with glitter and feathers. Who’s in? Rabbi Sharon KleinbaumTwitterRabbi Sharon Kleinbaum serves as spiritual leader of New York City’s Congregation Beit Simchat Torah.